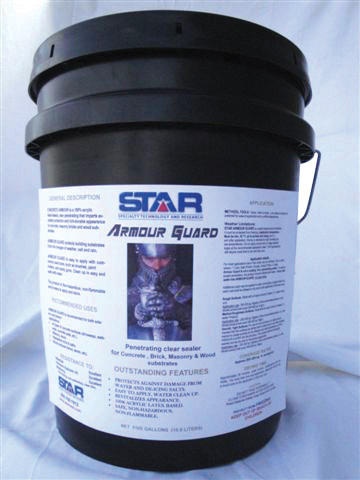 ARMOUR GUARD is a clear specialty penetrant and sealant designed for use on concrete driveways, foundation walls, sidewalks, masonry, stucco, brick, pavers, patio blocks, etc. Based on 100% acrylic latex polymers and specialty chemicals. Is a clear highly penetrating product that will not make the concrete surface appear wet, glossy or slippery. Slows the degradation caused by de-icing salts and chemicals. Easy to apply with water like consistency and fluidity. Safe to handle, non-flammable, and non-hazardous.